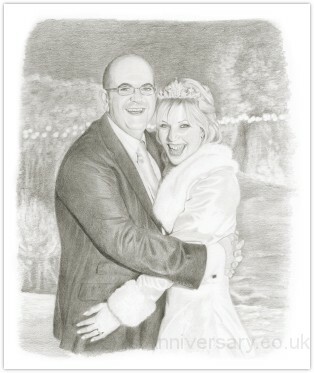 A pencil portrait makes a very special 1st anniversary gift. 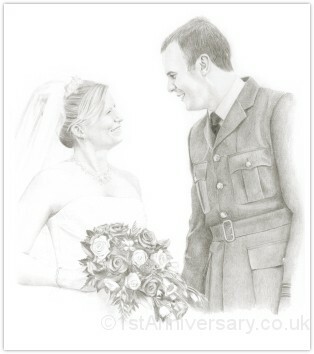 I can draw it from any good clear photograph - either taken on the day of the wedding or, perhaps, on the honeymoon. 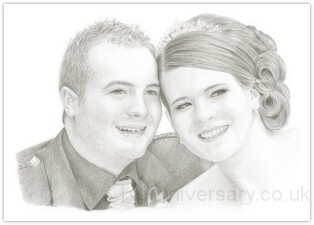 In fact, any favourite photograph of the couple can make a beautiful portrait. Although, being paper, it makes an ideal first anniversary gift, it can also be an ideal thank-you gift for the bride or groom's parents. I received the portrait on Thursday and was delighted when Carly opened the package this morning. She was extremely impressed and so was I, at the detail used to make the portrait. We are currently in the airport away to go on holiday and wanted to take this opportunity before we leave to thank you. This is defenitely the one anniversary out of the many we will have that we will remember the most. Just to let you know I have received the portrait. I am really pleased with it and can't wait to show it to my husband on our anniversary on Sunday - I'm sure he will love it as well. Got it and its brilliant!! Thank you so much.